Where is Don in Tennessee Today have not seen post by him have you. For some reason, if you open imjustwalkin for Day 152 the pix stop a bit earlier in the day — where Don had a lot to say. If you go to imjustwalkin and select 25 on the calendar, about 6 more pix appear which seem to be most current. Oh yeah, I forgot, CONGRATS MATT!! Don posted something about having a prior commitment to drive a church bus somewhere. Yes, that’s what he’s doing. Let’s have a tsunami party!!!!!!!!!!!!!!!!!!!!!!!!!!!!!!!!!!!!!!!!!!! Congratulations, Matt! Well done, my man. Well done. Now we pop the champagne!! Congrats Matt… Someone got a tissue? OMGOSH! YAY! Congrats Matt on this entire amazing journey! My family & I have checked your pictures everyday since day 40 or so.. you’ve been a great part of our lives this year, inspiring conversations and good laughes together.. you will be missed & never forgotten! This is it!!!!!!!! I’m not sure if I’m happy or sad but either way I feel the tears coming!!! Congrats Matt!!!! Hip Hip…I broke my hip dancing about! GO MATTTT!!!! Way to go Matt! Thanks again for the awesome pics, stories, people and places we’ve met along the way. How awesome to have been a part of your journey! Yes! Finally reaching that last destination. That’s got to feel awesome, even awesomer will be the beach and the awesomest will be the splash in the Pacific ocean! From sea to shining sea for sure! And you did it in record time, 5 months. Way better than getting there in December that’s for sure. Hooray for Matt! Awesome. I’ve been following you since Wisconsin. Are you going to walk home now? Kidding. Congratulations Matt!!! Thank you so much for sharing this wonderful journey with the rest of us. Awesome! Can’t wait to see pics of the ocean! Ok, I need the PUffs. Congratulations Matt! It’s hard to type through tears. YEAH!!!!!! Like Brian said now what? OH MY GOSH!!! FINALLY….Somehow this is bringing tears to my eyes…congratulations MAtt on your incredible, heartwarming, inspiring and faith renewing journey…and thank you so much for bringing us, the power to believe there IS still a respectable America!!! We all are sad your journey is done…but oh so happy you made it! Congratulations! You did what you set out to accomplish – you Rock!!! Most excellent! WAY TO ROCK, Matt! This was certainly a SUPER adventure and I was so excited to be following it. Congratulations, rest those dogs for a while! Goose bumps……….YAY Matt, I enjoyed “every” step with you. Take a rest, you have truly deserved it!!!! I think you will be doing lot of REP work about walking. THANKS FOR ALL OF THE MEMORIES. and click on I’m Just Walking, but all good things have to come to an end sooner or later. 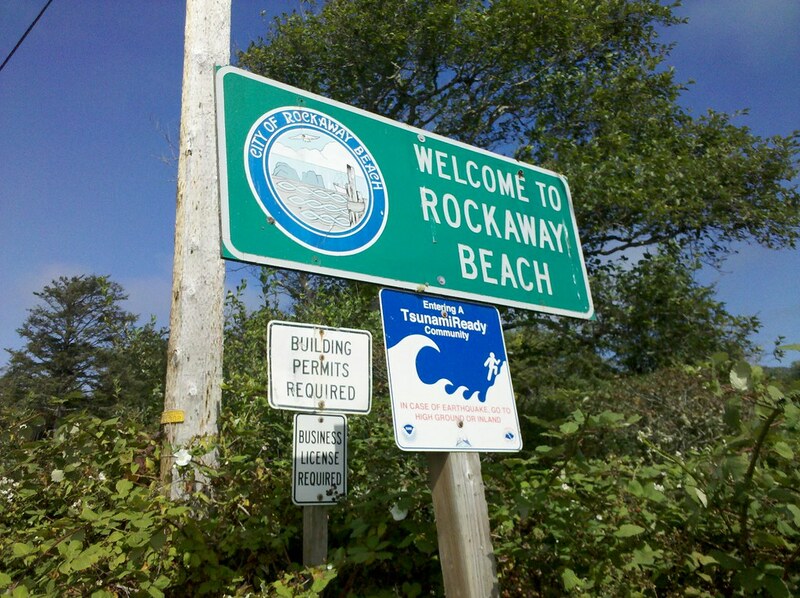 Woohoo, Rockaway Beach! Where’s the red caboose? Congratulations Matt and thank you for taking us along your journey. It’s been a pleasure “walking” with you. Cheers! Holy mackerel. I’m envious, excited, proud, and so many other things! Congrats!!! I’ve been following you since Michigan and I’m kinda sad to see the trip end. Amazing!!!!!! Matt you are almost there! Once you arrive and here is a Tsunami.. you’ll be warned!!! PS. My wife is Indonesian, and she lost family in the big one…they had no warning. We love and support u Matt. Congratulations Matt!!!!!! This a major accomplishment. Thanks for sharing all the great photos along the way. Best of luck in you future endeavors. I know that you will do well. Congratulations Matt! And thank you to the hobo nation for entertaining me since Matt walked thru Minnesota! You gave a glimpse of America not often seen. And this website reminds us how alike we all really are. Congrats on reaching your “destination.” It has been a pleasure to follow your trip since May! The pictures, tag lines and insight into America were fantastic. I went on vacation with you!!! Hope you relax, dip your feet in the ocean and enjoy whatever life brings to you next! NICE! I originally predicted to myself about 150 days! Great job MATT!!! Very nice job, Matt, thanks so much for sharing, I have enjoyed every pic you posted! My hat is off to you my friend. Im so happy for you. Wish I could have walked along with you but you were kind enough to share your experience with us and I thank you for it. note; what are we going to click on now? hmm gonna miss my daily updates with ya’ll…. Congratulations Matt. 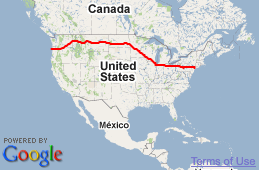 What an epic journey! I’m so glad that you shared this with all of us! I can “feel” your happiness right now! I bet you almost can’t believe that sign is REAL! Relish in the glory of it! Take your hat off, throw it in the air, jump up in the air and kick your heels! I can hear your shout clear over here in Greece! Yes, yes, yes! Awesome. It’s been a great journey, thanks for “taking” us with you! I’ve been following your blog since early on in your journey. Congratulations!!! You Did it!!!! My family has been following you since a few days after your departure. It has been a conversation almost nightly around the dinner table and quite the geography lesson for my kids. Not to mention a lesson in integrity and and what is really important in this life. Thank you for sharing your incredible journey with the world:) You’re such an inspiration! Congratulations!!! !